First of all, a brief human anatomy lesson: When you breathe air moves down the throat, through the larynx (voice box) and down the trachea (windpipe). The trachea then divides into two main airways that convey the air into each lung. 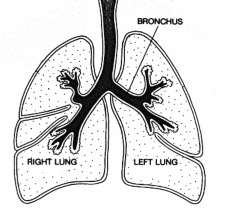 These are the right and left main bronchi (singular: bronchus). The two main bronchi are not exactly the same size because the two lungs are not the same size. The left lung is smaller than the right because the heart occupies part of the left side of the chest cavity. Therefore, the left main bronchus is orientated at more of an angle to get around the back of the heart. The right main bronchus is larger than the left, and more vertically orientated, and this is why any foreign object that has been inhaled and gets past the larynx is more likely to go down the right side than the left. It is a simple combination of anatomy and gravity. This is not a design flaw. It is only a problem if objects are inhaled, get past the throat and larynx, and cannot by coughed up. Normally the larynx prevents any solids or liquids from getting into the airways. Once that happens it doesn’t matter which main bronchus they enter, it is the same problem. This is most unlikely to have happened in the very good world of God’s creation as in Genesis. When our bodies were perfect the cough reflex would be more efficient, and catch anything before it got too far down. Therefore, it is unlikely that any food would get as far as a bronchus. Apart from food, the other source of foreign bodies in the bronchi is small dense man-made objects that are picked up and put in the mouth, or in children, chewed off fragments of toys. What kind of small dense objects that are unable to be coughed up would have been lying around the Garden of Eden? There wouldn’t be any safety pins, earrings, beads, ball bearings, etc. Furthermore, Adam and Eve had the best brains that God made and would have more sense than to put such things in their mouths. Ultimately we cannot blame God for the degeneration of our bodies or the environment. He made our bodies perfectly well to function in a pristine environment. It’s us who ruined things.